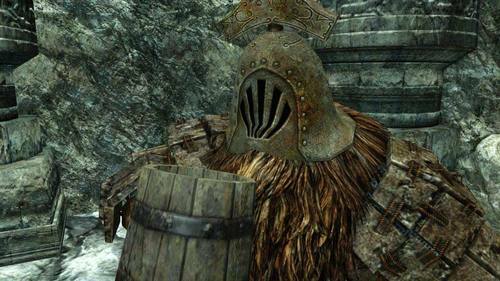 Lonesome Gavlan is a Gyrm trader who roams Drangleic. He is first found in No Man's Wharf, then Harvest Valley and he finally ends up at the Doors of Pharros, home of the Gyrm. Gavlan is always drinking from a wooden mug. What he is drinking is unclear, as is why. His title of "Lonesome" makes perfect sense considering his situation. Firstly, he is always by himself and secondly, he appears to be the last non-hollow member of a race that was rejected and exiled below the surface of the world. Gavlan is bilingual and unused dialogue has him speaking in what must be the Gyrm language. His speech is stunted and unclear, but he mentions wheeling and dealing a lot. Gavlan's motivations are clearly stated in your first encounter with him; he wants souls and his means of getting them is by trading. He is very interested in the Player's intentions, and will repeatedly ask what you want. This is telling of his race, who became reclusive and distrustful of humans before going hollow. Interestingly, when the Player walks away from their deal with Gavlan, he will ask them if they are going home. To him it must seem natural that this is where the Player is going, as perhaps it is where he is trying to go as well. Gavlan primarily deals in poison related items and the reason for this is unclear. He may have spent time in Shulva or the Black Gulch, or perhaps it was his race that created the human like statues that populate the Doors of Pharros (a large pile of them is directly behind Gavlan), The Gutter, Majula, the Black Gulch and Shulva, Sanctum City. His skill with poison may be unique to the Gyrm and would explain how the statues became infused with, said poison. So he is a travelling merchant, and will often ask if you are too. These are not in the game, but maybe they should have been. What Gavlan call his food? Gavlan Meal. What Gavlan call his pet? Gavlan Seal. What Gavlan do when eat banana? Gavlan Peel. How Gavlan fix pain? Gavlan Heal. What Gavlan say when he sad? Gavlan Feel. How Gavlan become rich? Gavlan Steal. What Gavlan favourite fish? Gavlan Eel. Gavlan wear what shoes? Gavlan Heel. How Gavlan fish? Gavlan reel. What Gavlan do when smell bad? Gavlan Reel. What Gavlan feel when contemplating ones existence? Gavlan Surreal. How Gavlan wounds close? Gavlan congeal. What Gavlan call struggle? Gavlan Ordeal. What Gavlan favorite fish? Gavlan Eel. What Gavlan call pitch? Gavlan Spiel. How Gavlan gain street cred? Gavlan fo-real. Umm… You want? Want what? Many deal… Many thanks! Gah hah!